08/28/2018 10:51 PM - FARGO, N.D.  The Chicago Dogs scored two runs in the top of the ninth inning to extend what already was a two-run lead and take the series finale from the RedHawks by a score of 7-3. Fargo-Moorhead finishes the year 4-8 against the Dogs in 2018. With six games to go, the RedHawks trail the Gary SouthShore RailCats by five games for the final playoff spot in the North Division. Fargo-Moorhead opened the scoring with two runs in the top of the first inning courtesy of a two-run double from Leo Pina and tacked on another in the sixth to finish the night with three runs on nine hits. Chicago scored three runs in the fifth inning to take the lead and added four more runs over the final four innings to finish off the win. 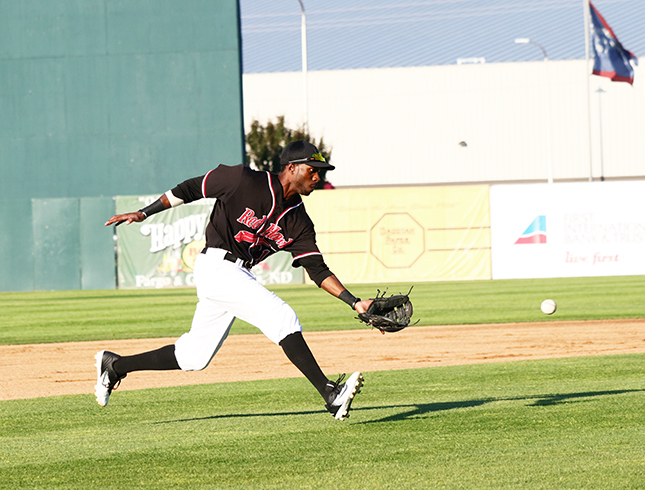 The Dogs finished the game with seven runs on nine hits to claim their eighth win of the year against the RedHawks. Michael Tamburino gave up four runs on four hits in 5.1 innings on the mound in his fifth start for the RedHawks this season. With the loss, Tamburino falls to 6-7 on the year. With Garys win over Wichita tonight and the RedHawks falling to 49-45, the RailCats magic number is down to one game. Any combination of a Gary win or a Fargo-Moorhead loss will eliminate the RedHawks from playoff contention. The Hawks will travel to Winnipeg for a three-game series with the Goldeyes beginning Wednesday night at Shaw Park. Fargo-Moorhead will return to Newman Outdoor Field on Saturday for the final three games of the 2018 season against the Sioux Falls Canaries.